When Shawn steps into the Walmart parking lot, he stands a little taller. A slight smile is almost always on his face as he moves through his workday. 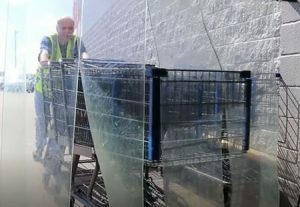 The job involves a seemingly neverending task — moving shopping carts from the edge of the lot to the inside of the building. Some might groan and complain. But for Shawn, each shopping cart, and each trip to and from the store, represents so much. Independence. Opportunity. Growth. Being part of a larger, more diverse community. These are all things that Shawn craved and expressed to his family and case coordinators. Now they are no longer pipe dreams or abstract ideas. They are his reality. The Building Futures program, offered through Human Support Services, is part of a larger movement toward person-centered services for individuals with intellectual and developmental disabilities. 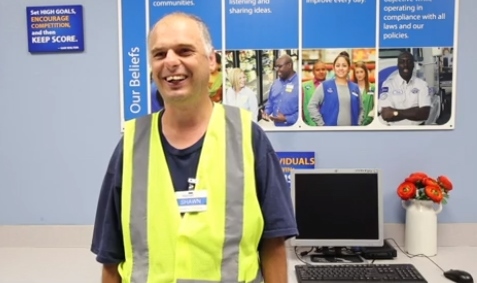 The program pairs motivated workers like Shawn with employers in the community. For the businesses, it is a chance to tap an eager workforce that truly sees each job as an opportunity, not just a paycheck. Often, individuals with intellectual and developmental disabilities are filling business needs that may have otherwise gone unfilled. For Shawn and others, it is a valued role — a stepping stone to building an independent future. Shawn’s smile comes from a sense of purpose, and his delight in being able to shape his own path and follow his own interests. It also comes from the camaraderie he feels with fellow employees and the customers. Not to mention the satisfaction he gains in being able to earn a paycheck and pay for his own things. After all, aren’t those things we all crave? That’s the whole point of the Building Futures program. “We’re looking at how can we allow the people we serve to have the best life, to experience the most quality, to have the most meaning,” explained Jessica Liefer, director of person centered services at HSS. For Shawn, it started with a simple wish, and someone who was willing to listen. He had been expressing a desire to work for quite a while. So when the Building Futures program started up, and Walmart’s Missy Whittington began asking about potential job candidates, Liefer knew exactly who to ask. “We knew there was more for him than working in (the HSS) workshop,” Liefer said. Shawn’s new job was a test run, of sorts, for the larger program. At the time, HSS didn’t have a job coach yet. 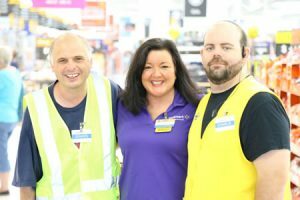 So for a couple of days, Liefer went to Walmart with Shawn to see how he would enjoy being a cart attendant. “I did not realize how hard it was,” she said, chuckling. It was a physically demanding position, and Shawn was worried. He desperately wanted to work, but would the job prove too difficult for him? Would he bump into cars with the carts? What about when it rained or snowed? Whittington was quick to jump in and offer encouragement. She also customized the position in a way that allayed Shawn’s concerns. Shawn would just take the carts at the edge of the lot into the building. 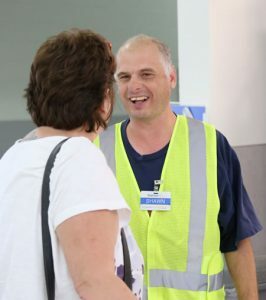 No more fears for Shawn; still a tremendous help to Walmart. There’s a point here that shouldn’t be lost. The businesses involved in the Building Futures program gain satisfaction and practical benefits as well. “They see the quality it brings to their business, so that’s exciting,” Liefer said. “I think they are happy to see things moving forward for him. They are glad that others see opportunity and potential in him as well,” Liefer said. That extends to Shawn’s girlfriend, who recently received a gift from him: a beautiful ring, one of the first things he bought with his Walmart paycheck. Shawn is one of many who are now involved in the HSS Building Futures program. And his story illustrates a common theme: that helping one person realize their dreams can better connect our whole community. Invest in Shawn’s future — a future we all share, and have a stake in — by contributing to our annual holiday appeal today.